Sorry I haven't been so talkative lately, still trying to figure out certain things about this blog... but in addition to that, I've been pretty busy lately doing all sorts of stuff, including teaching various foraging and shopping classes around and more importantly, getting ready for my trip! I leave tomorrow for Lublin, Poland, and I'm really excited. My itinerary changed from what I'd originally planned- instead of just staying in the Lublin area, I'm taking a double decker bus to Warsaw where I'll be spending two days, before coming back to Lublin by train. I already found out details about the public transportation and purchased tickets. This Friday, a blog reader who lives near Lublin is meeting up with me. She's been very helpful in figuring out my trip- can't wait to meet her in person and explore Lublin's old town together. I've found out about a free plus tips walking tour in Warsaw that I am planning on attending, but beyond that, I'll take exploring Warsaw by ear. To get ready for my trip I've had to do a lot of research on availability of groceries, so I know what I can buy there and what I need to bring from home, checking out the weather forecast (coat probably necessary for evenings, possibly an umbrella). I did some research on cell phone plans while away (as a mom, I've gotta be available), and about luggage. Since I'm flying with a cheap airline and not bringing any checked luggage, I needed to get luggage that fit the requirement for carry on luggage. 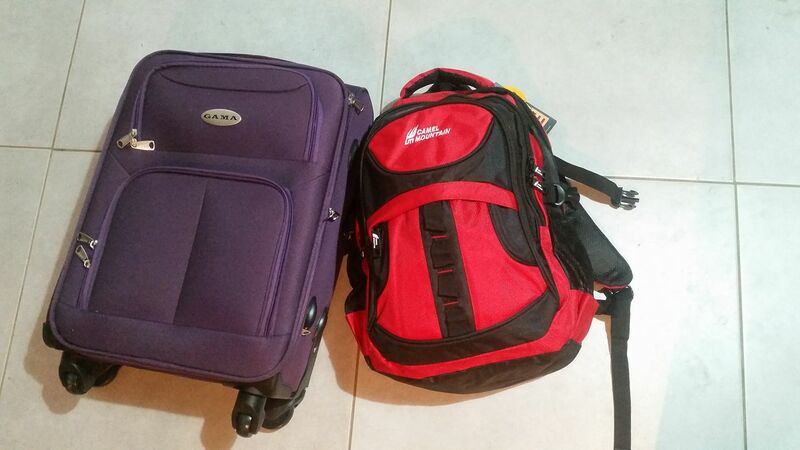 I can bring a carry on item fitting a specific dimension, and under 8 kg, as well as a personal bag/laptop bag. I had neither (my small suitcases that I would use for a carry on were bigger than the allowance, and my laptop bag wasn't useful), so I found a store that sold both cheaply enough- a small roll-able carry on, and a laptop backpack that can carry some more items other than just my laptop, so it can double as a personal bag. For safety purposes I went with a money belt, so that was another purchase. Yes, these added on to the cost of my trip, but all these are items I will be using again anyhow. Now that I have my luggage, it's time to pack my bags. Figuring out what to bring on a trip isn't easy, especially when I'm limited to just two small carry on items, so I'm trying to make sure to get everything I need but not overdo it, but I think I'm finally all packed. Fortunately there is now a bus service that takes people directly to the airport from my nearest city, so it should be relatively straightforward and cheap to get there, instead of the complicated mess/expense it used to be. I stocked the house with plenty of easy to prepare food for the hubby and kids to eat while I'm gone. I just need a good night's sleep, and I'll be on my way tomorrow! Can't wait to update you! Are you doing any frugal vacationing this summer? What type? How are preparations and research going? Enjoy your trip! It sounds like the perfect trip for you right now. I'm a female and have done a few solo trips internationally and never felt it was a crazy thing to do. It's a great feeling to figure out everything by yourself. Looking forward to reading about it when you return. But yes, I think this trip is exactly what I need now. Don't need to wait for me to get back for me to update- I plan on updating every day or two while on the trip. :-D Solo traveling, not planning on going out much at night, so yes, down time where I'm staying to update my blog. Penny, have a safe trip and send regards to President Trump! Thank you! Not going to the US or anywhere near Trump... haha. I'm going to Poland. Have a great trip. I have seen Fascinating Aida on stage and they were marvellous!